Laura takes a practical, no-nonsense approach to proving and improving the value of Marketing. Laura began her 25+ year career in sales and had the great fortune of working across functions spanning customer relationship management and Marketing with a capital “M”. Today she is at the helm of VisionEdge Marketing, founded in 1999, and is recognized as one of the pioneers and authorities in the Marketing Performance Management (MPM) discipline. The company specializes in helping companies apply data, metrics and proven best-in-class practices to improve Marketing effectiveness, deliver business impact, and enable better business decision-making. 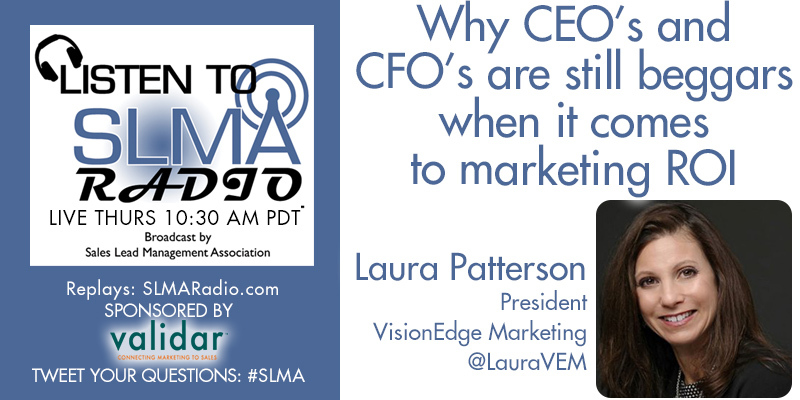 Laura and VisionEdge Marketing are all about making Marketing an engine of growth for organizations. Martechexec selected Laura as one of the top 50 women in marketing technology. Laura serves on the University of Texas McCombs School of Business Masters of Marketing Science Advisory Board. Since 1999 VisionEdge Marketing (visionedgemarketing.com), a data-driven metrics- based strategic and product marketing company has specialized in improving marketing performance and helping organizations make better fact-based decisions when it comes to markets, products, customers and competitors. Our passion is to help companies of all sizes solve four critical business problems: How to acquire and keep profitable customers, how to successfully define and launch market-leading products and services, how to create performance-driven marketing organizations, and how to accurately measure and improve marketing’s contribution to the business.